Move over salmon, tuna, unagi, or shrimp nigiri sushi. Who even cares for California rolls? Here comes the beef steak sushi. Some people are afraid of trying sushi because of seafood. I know not everyone is fond for seafood. Sushi doesn’t always have to be made with seafood. 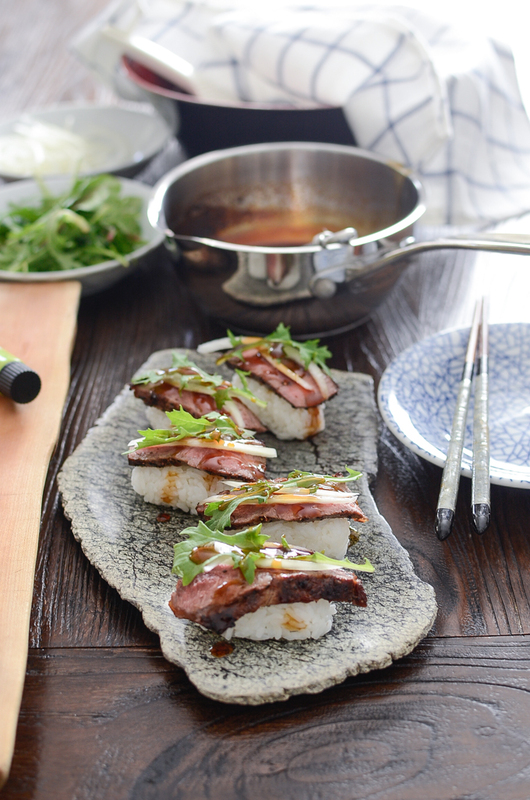 If you are a beef lover, especially the juicy and tender steak, you will love this beef steak sushi with teriyaki sauce. Don’t they just look gorgeous? If you serve this beef steak sushi all decked up on a nice serving platter, people might think you are a sushi master. 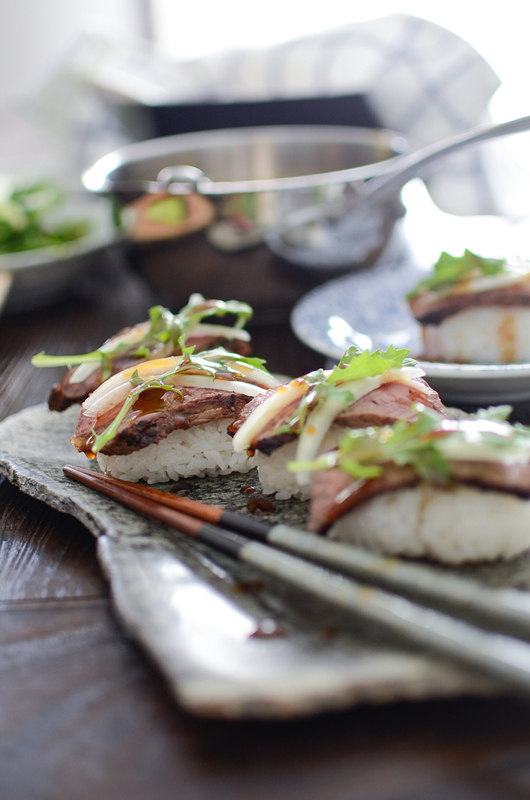 In fact, any sushi novice can make this beef steak sushi like a pro. It is easy, and to-die-for delicious. I promise. 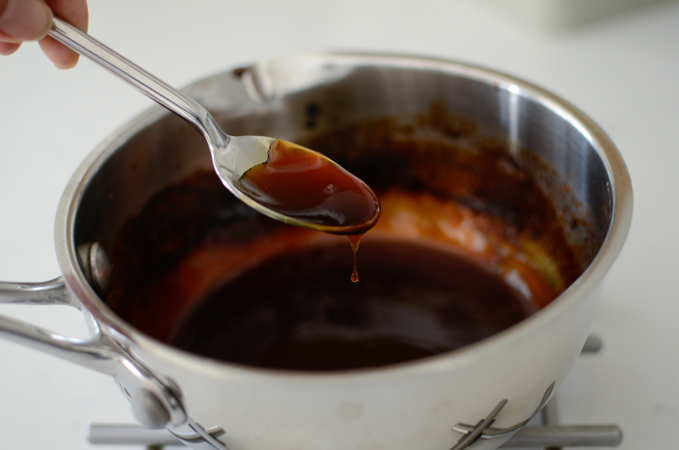 The accompanying teriyaki sauce alone will be perhaps the best kind you can taste as a homemade. It goes so well with beef steak sushi. Try this recipe at home. If you love enough, then entertain your guests. They will love you, adore you, and who knows? They might talk about it for the rest of their lives. 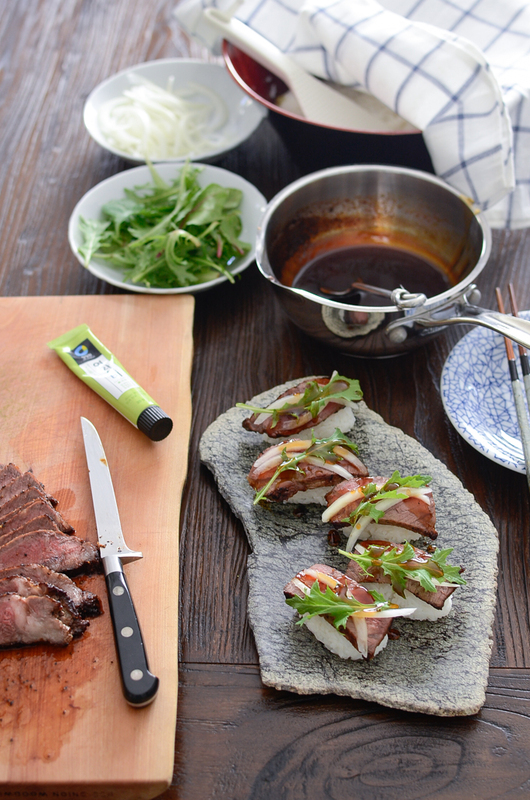 I will explain how to make this beautiful beef steak sushi step by step. This will be a rather long post since I am putting three different recipes all together; teriyaki sauce, sushi rice, and the beef steak sushi. So be patient to read all the way thorough. 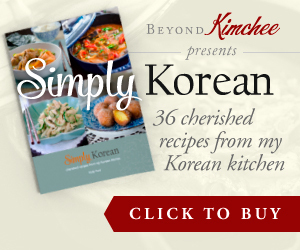 I am already regretting that I should have separated the recipes. Well, I guess I’m too generous. 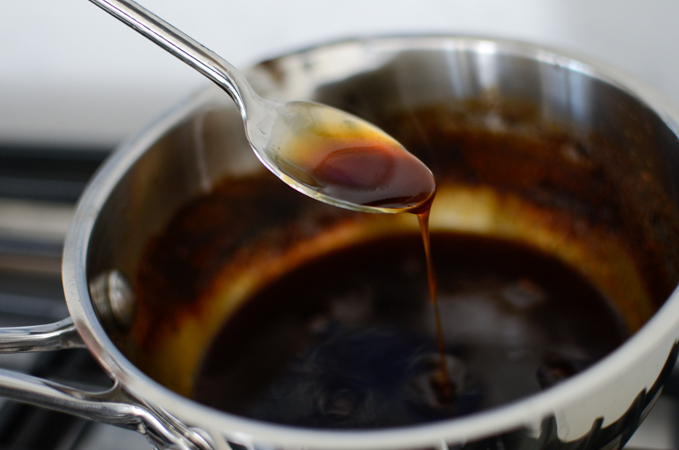 Homemade teriyaki sauce is very easy and quick to make. The secret ingredient of my teriyaki sauce is a little bit of pineapple juice. 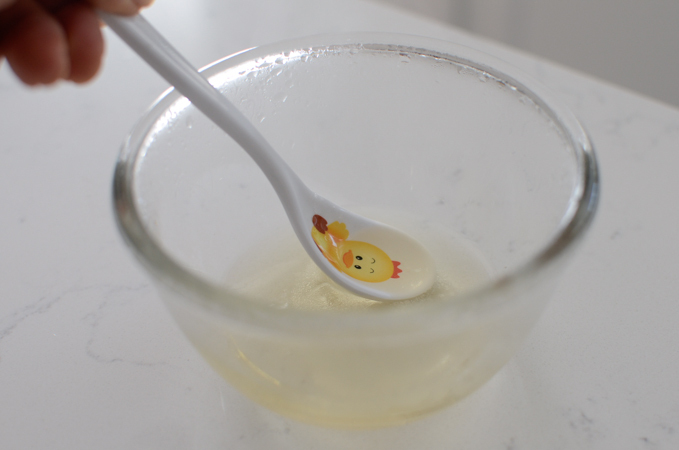 It adds a wonderful sweetness that sugar alone doesn’t provide, and you don’t need to add too much sugar either since pineapple juice is sweet. Try this recipe. 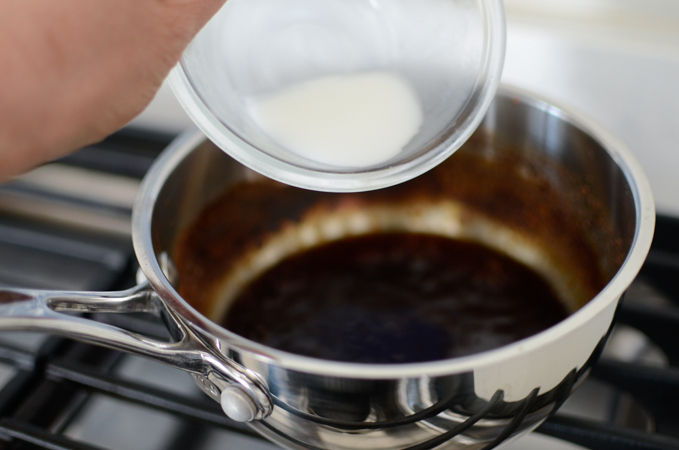 You might find this would be the *eureka* for the teriyaki sauce. If so, give me an applause? Thank you. 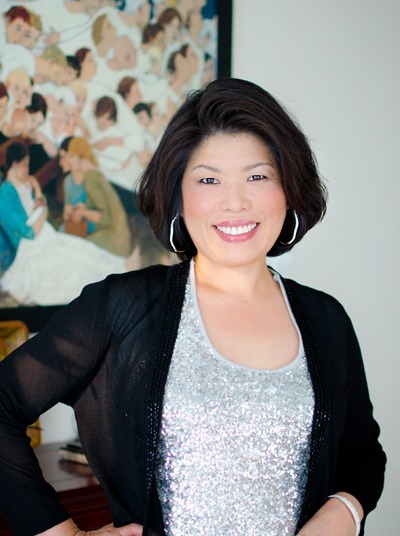 Combine soy sauce, mirin (the sweet rice wine), brown sugar, pineapple juice, and three slices of ginger. Bring to a gentle boil over medium heat. Remove the ginger and add the corn starch+water mixture. Continue to boil until it thickens. Cook 1-2 more minutes. You might find it still loose, but that is perfectly fine. It will get thicker as it cools. After about 10 minutes, the consistency of teriyaki sauce will be like a glaze. Perfect~! 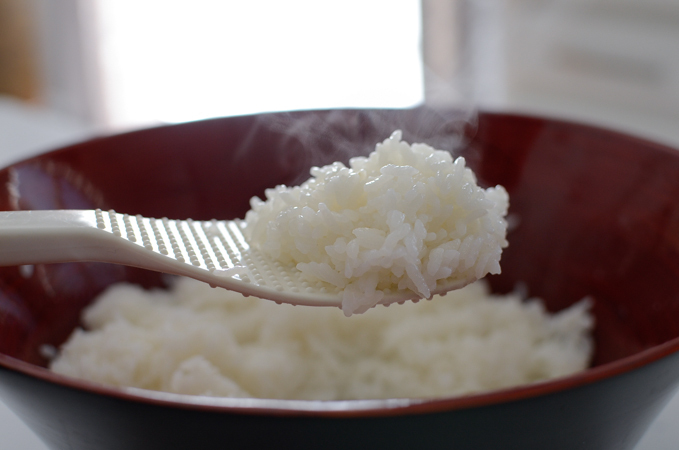 For sushi rice, you will want to use the short grain white rice that is suitable for making sushi. Rinse your rice for several times until you get the clear water. You will want to remove starch coating of rice as much as you can. 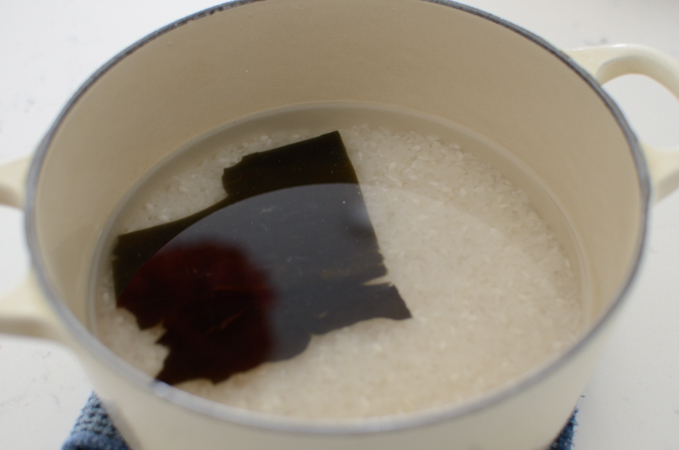 Soak the rice in water for 10 minutes with a piece of dried sea kelp (aka kombu). The sea kelp will make very flavorful sushi rice without tasting the sea flavor. You will need to discard it after 10 minutes. The rice and water ratio I like to use is somewhere around 1:1.25 to 1:1.5. I like to cook my sushi rice over the stop top rather than rice cooker for a best texture. Bring the pot on the stove and cook over high heat. When the rice is boiling, stir with a folk to evenly distribute the grain. Reduce the heat to low and cover with a lid slightly loose for about 3 minutes. Cover completely and simmer for another 5 minutes. Turn the heat off, and let it sit on the stove for 5 minutes. For the sushi rice seasoning, mix rice vinegar, sugar and salt in a bowl and microwave for 30 seconds, then stir well. This will dissolve sugar and salt, and intensifies the solution. Transfer rice to a wooden bowl, if possible, and add the vinegar solution. Mix rice in a folding motion trying to coat evenly. The rice should hold its grain. At this stage the sushi rice is too hot use. Cover with a clean cloth and let the rice cool to the room temperature. 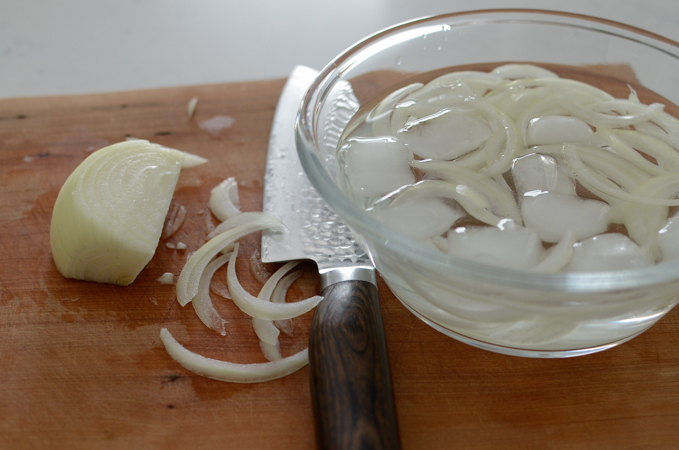 Before you start the steak, slice 1/4 onion very thinly and soak them in ice water. This is for garnishing the sushi. By soaking onion in cold water, it will remove the spiciness of raw onion and become more mellow to enjoy. After 10 minutes, drain and spin off the excess water. For the steak, use your favorite cut of beef. I like to use NY striploin. Ribeye or tenderloin is great, too. Get a best quality beef you can get. Season lightly with sea salt flakes and pepper. And cook over your outdoor grill or skillet. 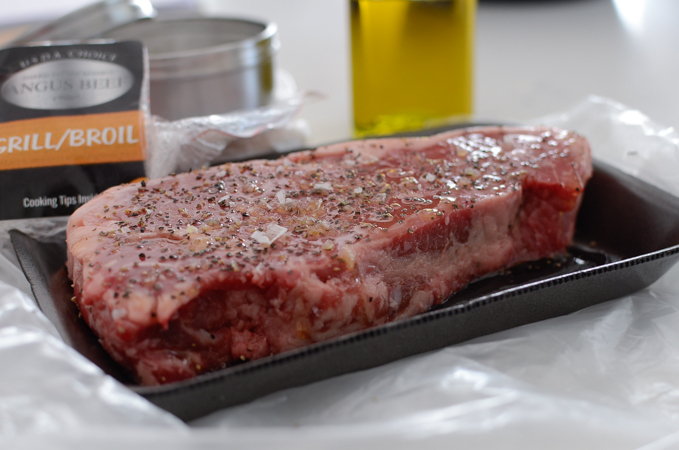 Make sure to sear all the surface of your steak very well to keep the meat juice inside. If your steak is very thick, you will want to finish it off in the oven so that you don’t burn the outside. 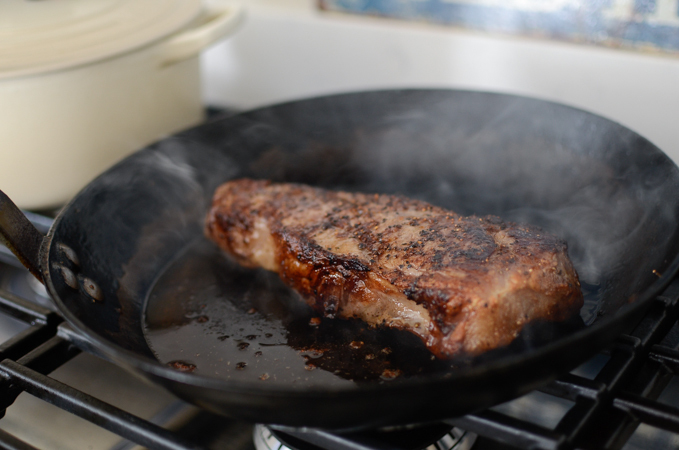 Cook your steak according to your preferred doneness. Mine turned out to be slightly medium-well this time. Medium would be perfect for sushi. 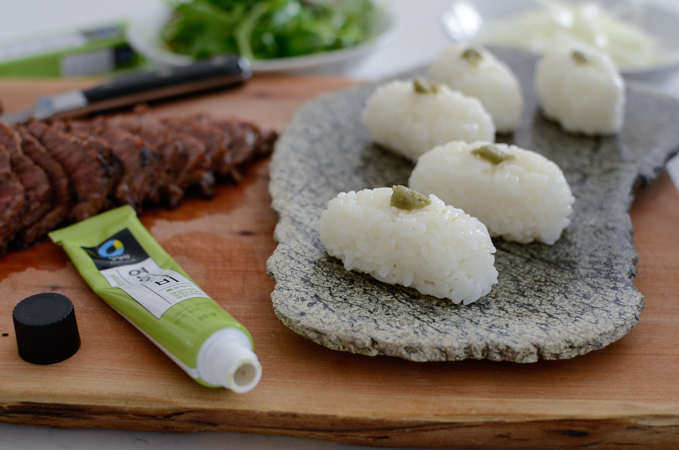 Shape your sushi rice into a small pillow-like shape. As small as or as large as you like. Just remember, you will have to put the whole thing in your mouth. Dot it with a little bit of wasabi in the middle. The amount is up to you. Top with a slice of beef steak, a couple of onion slices, and some spring sprouts. Use any green sprouts of your choice. Turnip sprouts, alfalfa sprout, fricassee lettuce are great choice to adorn. 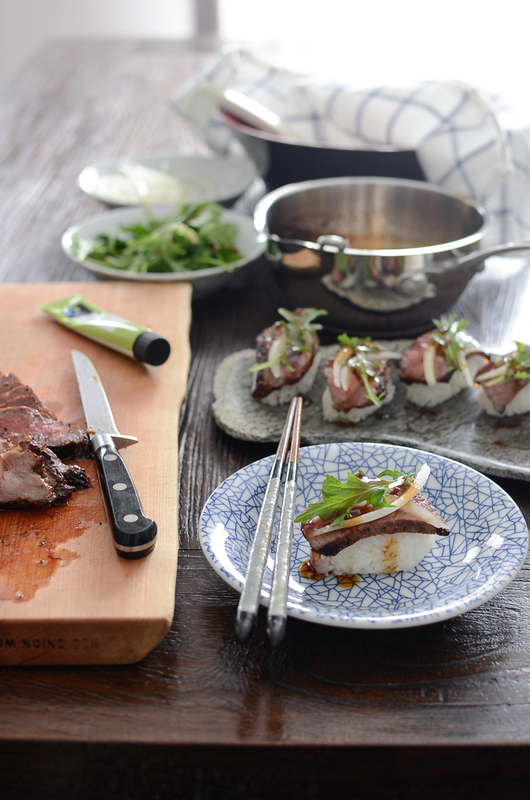 Then drizzle with teriyaki sauce. Now they are ready. Pretty, aren’t they? Let me tell you how delicious they are. You will flip! I kept eating, eating, and eating. I was only going to eat 5 pieces but couldn’t even remember how many more I had. My little rice belly was not little anymore after the meal. LOL. I hope you get to try this out at home. This might become a new family sushi tradition. 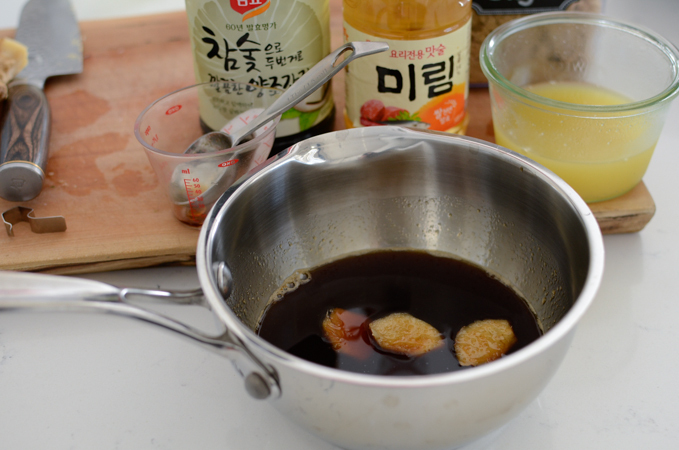 To make teriyaki sauce, combine soy sauce, pineapple juice, brown sugar, mirin, and ginger in a small pot. Bring to a gentle boil over medium heat stirring occasionally. Mix cornstarch with 1-1/2 tablespoon water and add to the sauce. Cook until he sauce thickens, about 2 minutes constantly stirring. Remove from the heat and set aside to cool. The sauce will thickens more as it cools. 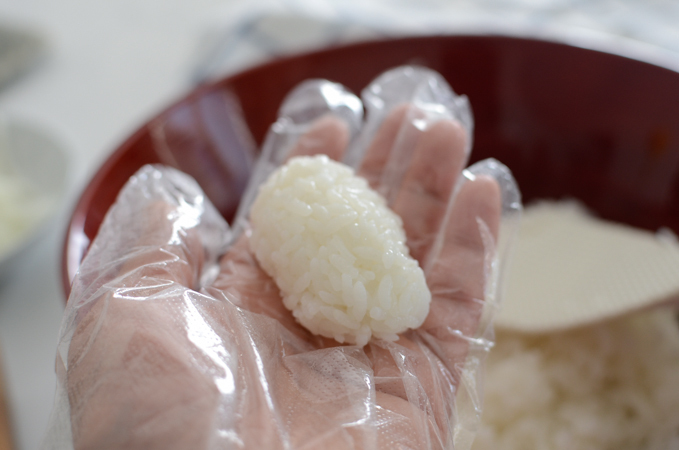 To make Sushi rice, rinse the rice 5-6 times to remove starch coating from the grain until the water seems clear. Add 2-1/2 cup water and a piece of dried sea kelp and let it soak for 10 minutes. Remove the sea kelp and bring the rice to boil over high heat. When the rice boils, stir with a folk to evenly distribute the grain. Reduce the heat to low and cover loose with a lid, simmer for 3 minutes. Cover tight with a lid and continue to simmer for 10 more minutes. Turn off the heat and let the pot sit for another 5-10 minutes. Meanwhile mix vinegar, sugar and salt in a small microwave-safe bowl. Microwave for 30 seconds. Stir well. 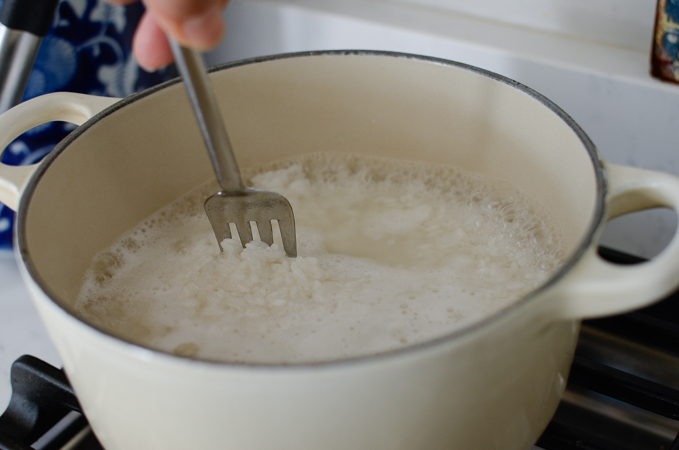 Transfer the rice into a wooden or glass mixing bowl. 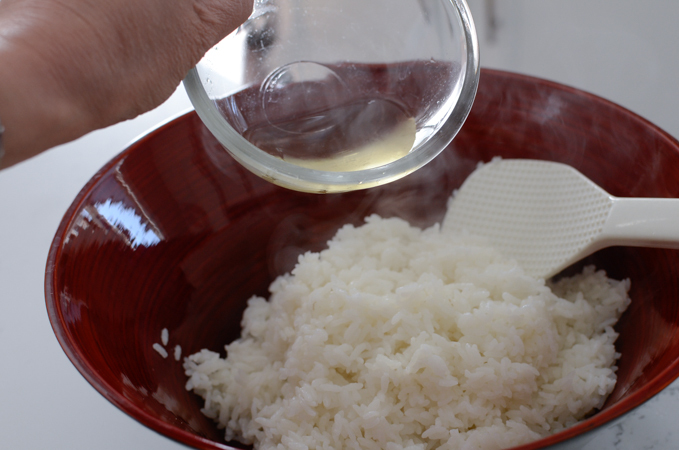 Add the vinegar solution to the rice and mix in a folding motion to coat all the rice grain with the vinegar solution. Cover with a clean cloth and let the rice cool to the room temperature. To make beef steak, season the steak with salt and pepper lightly. Grill or pan fry the steak by searing all the surface first. If the steak is too thick, you will need to finish it off in the oven. Cook the steak to the medium doneness. Let the steak rest for 5 minutes. 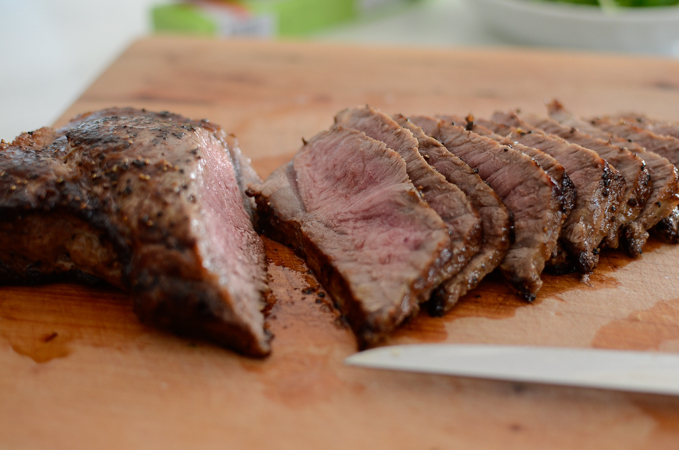 Slice the steak against its grain, between 1/8 to 1/4-inch thickness. 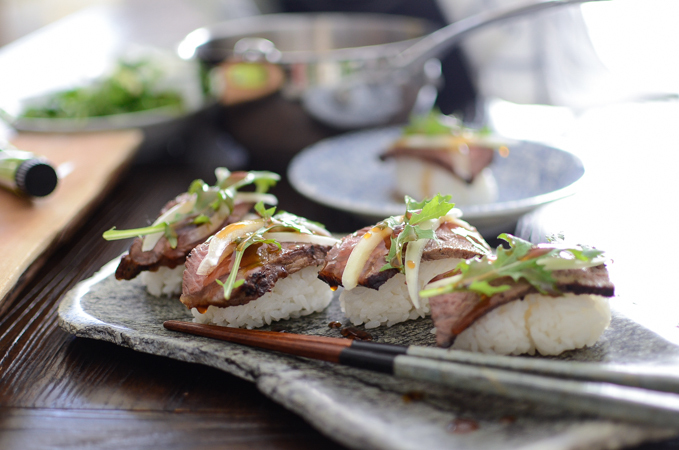 To assemble the beef steak sushi, soak the onion slices in ice cold water for 5 minutes, drain and spin off to remove the excess water. Seat aside. 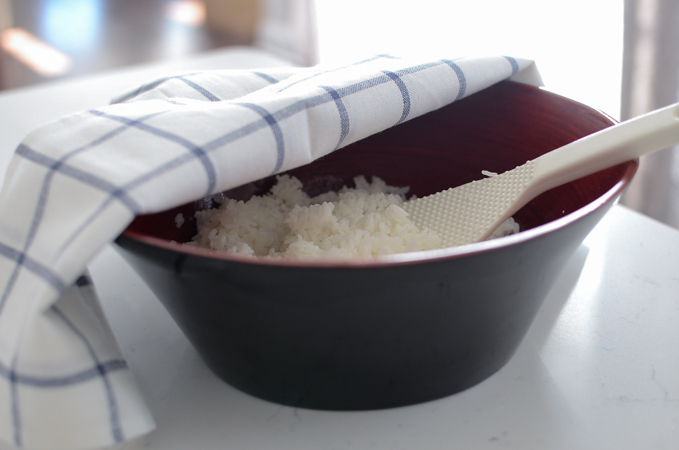 Take 2 tablepsoonful of sushi rice and press gently to shape into an elongated oval form. Dot with a small amount of wasabi on the top. Place each sushi on a large serving platter. Top with a slice of beef steak, a couple of onion slices, and spring sprouts. Drizzle with teriyaki sauce over. Enjoy! I didn't know they had beef sushi! Great idea -- this looks wonderful. Thanks. I made it and it was very good!